Amnon Gabay, Lorraine Cable, Matthew Dyer, and Joe Seo. 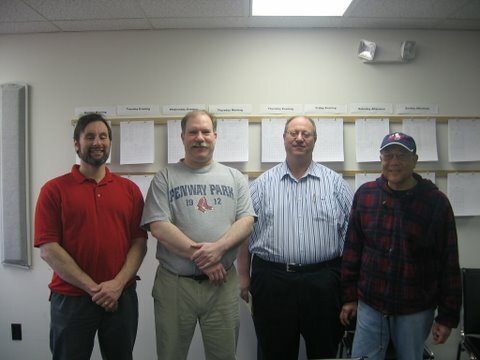 These four-person teams survived both a round-robin and a long semifinal held in Sturbridge back in January. The match would be 56 boards with no carryover, to determine who would be subsidized to represent New England at the 2009 Summer NABC in Washington DC. The four pairs differ in style and gadgetry. Cable-Dyer play 10-12 notrumps. Both Souths opened light in third chair. On a double-dummy basis, Gabay guessed correctly to devalue the West cards. However, after three rounds of hearts for a ruff, Montague cashed the ace of diamonds. Placing Gorsey with the trump queen for his opening bid, declarer cashed one high trump, ruffed a club to dummy, and finessed the SJ for down one. Gorsey tried three rounds of spades against Seo's 2D, ruffed and overruffed. Declarer drew trumps and made three - there's no way to stop nine tricks. Gabay's 3C was cold. He used the CQ entry to dummy to lead a spade down, and lost only two hearts, a diamond, and a spade. The Cable team did a lot of bidding on a deal on which nobody can legitimately make much of anything. Against Gabay's 2C, Montague led a spade to the S10 and SK. Gabay's C10 held, as did a club to dummy's C8. A diamond to the king lost to the ace and the defense cashed two spades and switched to hearts. Declarer ruffed a heart, cashed DQ, took a diamond ruff, and ruffed another heart, but that's only seven tricks. Down one, -50. Lau tried an offbeat opening lead of his singleton H4. Dummy's H7 held, as did Dyer's HQ at trick 2. Perhaps Adler would have done better to win his HA on one of these tricks and put the C10 through, clarifying the situation to Lau, but Adler was concerned the hearts might become established. On winning his HQ, Dyer tried a spade at trick three, and Lau made the good play of rising the SQ to force dummy's ace. A diamond to the eight lost to the ten. Best defence was still on track to prevail, but now Lau switched to a club, which ran to Dyer's CQ. A spade to dummy's SJ had to be ducked, and Dyer led another diamond down, winding up with two tricks in each suit for 120, to win 2 imps and trail 21-7. No defense should beat East's 3NT. Seo won the spade lead with his jack and led a heart. Gorsey won, Montague playing a reverse Smith H6, indicating dislike of spades. Gorsey switched to his D7 - DQ, DK, DA. When Seo knocked out the other heart, Gorsey continued diamonds, but now Seo played a diamond right back, establishing the suit, and thus made three for 600, losing two hearts, a diamond, and a club. The choice of South's minor suit opening bid was according to style. Cable-Dyer open 1C with 15-17, 1D with 13-14. Adler led a club to Lau's CA. With the diamond finesse working, Lau has no legit defense. If he doesn't take a spade, it will go on the CK. However, when he cashed his SA, two hearts went on the black kings. His only real hope would have been to underlead in spades, but I doubt Cable would be fooled on the bidding. Gabay opened the bidding on fumes at unfavorable vulnerability. Montague led a diamond. With all suits splitting and both major suit aces onside, Gabay scrambled six tricks for down two. Both declarers made 170 on this favorable lie of cards. There's a way to hold spades to 140, which wasn't found. 4H and 3NT are both cold with 17 high card points opposite 5. Few partnerships would bid this game, even vulnerable at imps. Montague led the HK. Gabay ducked some hearts, won his HA, lost a spade finesse, and later cashed his seven tricks for down two, -200. Cable-Dyer weren't on the same page during this auction. Dyer had to lose at least a trick in each suit, and wound up losing the long heart as well for -150. Lau lost a club and two trumps for 130 in his safe 3D contract. Of all the contracts declared in this match, I consider Gabay's 4S to be the most difficult to play, defend, or analyze. What happened at the table is that Montague led his DK. Gabay won dummy's DA, noting Gorsey's D10, cashed dummy's HQ and SK, led a another spade to the S10 and SJ, and, after some thought, tried a second diamond, hoping diamonds would split or if not, that Gorsey would err and let a heart go on Montague's diamonds. Montague cashed two diamonds, Gorsey discarding clubs, and exited with a third round of trumps to Gabay's SA. Gorsey won the fourth heart and cashed a club. Gabay claimed - down one. First, let's consider the position at trick five, after the SJ won. The appearance of Gorsey's S10 means spades are surely splitting, but the trick one D10 suggests the actual position in diamonds. An alternative line that shouldn't work is heart ruff, club from dummy. If Gorsey wins this trick, 4S will be made. But Gorsey should see that he needs to get Montague in, and that he has no way over but in clubs. He should duck his C-AKQ, and Montague should win and cash the D-QJ. Then best defense would be for Gorsey to discard two hearts, and for Montague to give him a ruff. It also doesn't work for Gabay to cash one high heart and ruff the third, because now Gorsey could get in with a club and give Montague a heart ruff. The winning alternative is to cash both hearts discarding clubs from dummy, and play a fourth round. Dummy's trump is the S7, Montague's the S8, so Montague can ruff high, but if he does, Gabay can discard dummy's last club, and the defense has no winning reply. The half ended when the defenses scored two hearts and a spade for a push at 5C down one. Any game can be defeated - 4S by means of a club ruff, 3NT from either side, by North playing the DK on a diamond lead, or South winning a heart lead with the HK and shifting to a diamond. However, those defenses are harder to find than cashing three top tricks against 5C, either on the go or after winning the SA. Having opened that slime as West, I think I would have passed at my last turn on either auction, but then again, crime had paid off handsomely on several of the first half boards. The teams compared, agreed that Gorsey led by fourteen, 69-55, and broke for a 45-minute lunch. When they resumed, they switched seats. I'm going to record the last 28 boards as 29-56, although they were really 1-28 again. This means the vulnerability and dealer will appear to be wrong, but pay no attention. I know what I'm doing, I think. Subtract 28 from the board number, and the dealer and vul will be standard again. Seo won won dummy's HJ at trick one, successfully finessed his DQ, cashed the DA pitching a club from dummy, and led a club to dummy's CJ. With the CQ dropping, he had four spades, a heart, two diamonds and two clubs for nine tricks. Both Easts led clubs. Gabay made five, Montague six. An imp to Gorsey, who led 70-68. Our North-South's went overboard here. Lau underled in spades. Gabay tried a heart. The defense cashed six tricks. Gabay dropped the CQ at the end for down two. Seo won the spade lead in dummy, came to his hand with a diamond, and led a heart to dummy's H9. He eventually lost only two hearts and a spade for 430. Gabay won the DJ lead and played three rounds discarding clubs from dummy, then led a spade to the S10 and SJ. A club tapped dummy, but trumps lay favorably for declarer, and Gabay merrily crossruffed for 170. Obviously, there are several ways to hold this to 140. Adler-Lau were optimistic in the auction, not for the first or last time. Gabay led the CK and Adler won dummy's CA, took a spade finesse, then a heart finesse. The miracle in trumps didn't happen for Adler, and a trump came back. Adler played a club, and lost two clubs, a diamond, and a trump for -50. It is interesting to note that Adler could still make this contract by winning the second heart in dummy and leading a diamond towards the AJ. If Seo doesn't split, the DJ wins and the subsequent crossruff comes to ten tricks, but if Seo does split, and wins the second diamond to play his third trump (best, since he has no club to lead), the fall of the D9 means both dummy's diamonds would be good, and declarer would make 1 club, 3 diamonds, 2 spades, 3 hearts, and a ruff for ten tricks. Montague tried a fancy 6S over the grand slam force. If he was suggesting 7NT he failed, but at least the 1500 grand slam bonus was secured. Fine biddings from Montague-Gorsey. Gabay led ace and a heart against Gorsey's 2D. Declarer should make this - cash the five side winners ending in dummy to lead a heart, or else ending in hand to lead a spade. Either way, trump tricks are slowly promoted. Because declarers spots in the majors all turn out to be working, it also works to just play on trumps. But Gorsey won the HK and played a third heart immediately. Seo discarded a club, and the contract went down one. Dyer won the SQ lead in dummy, led a heart to his HK, finessed the CJ, and ran off the first nine tricks. Very well done by Cable-Dyer. If Adler had risen his heart ace and shifted to diamonds, Dyer could still get home by dropping the CQ and jettisoning dummy's blocking club on the HK. 400 to go with 50 meant ten imps to Cable, now back in the lead 110-108. Gorsey's 2NT was a raise to 3C, but Montague feared that contract and passed. Gabay led a diamond to the D10 and DA. Seo returned a heart. Gorsey came to hand in spades and drove clubs. When he got in with his CQ, Seo cashed three hearts, but that was all. Making two. Seo's 1NT was cold. He won a spade and ran six diamonds. The defenders had the rest. Plus 90. Montague tells me this board has convinced him a negative double is better than a one heart response with the North cards. Dyer cashed his SAK and shifted to diamonds. Declarer led a heart to the king and ace. Cable returned a club to Dyer's CA, and he played the CQ to the CK, ruffed. Declarer still lost the last club for down one. Adler's 2C was two-way new minor forcing. The Adler-Lau 3D contract lost two hearts and two diamonds. You can't ask for a better all-deciding board. Vul against not, it's quite risky to overcall 2H over Stayman with that South hand, but it's also risky not to overcall, as Gorsey found out when Montague led an unimaginative spade. Declarer knocked out the club ace, won the heart shift, and ran his tricks. Gorsey blanked his DK in the endgame, but Gabay was cashing his nine tricks in any event, so all Gorsey did was turn 400 into 460. If South were to overcall, it would be hard for East-West to go plus. They can't beat 2H, and 3NT won't make on a heart lead. The best they can do is 110 or 130 in a minor. That would be a loss of 7 or 8 imps. But Cable passed just like Gorsey did. Last chance for Dyer. No, Dyer led a spade just like Montague. Cable kept her diamond guard in the same ending, so declarer was held to 400. She won two imps, but lost the match by four, 120-116. I wish to congratulate Bob Gorsey, Neil Montague, Brett Adler, and Larry Lau on a thrilling nail-biter victory, and I wish them luck in Washington DC this summer. I would like to thank all the players for letting me watch, and also those who helped fix errata in the first draft. Remaining errors are mine. That's it for the GNT this year, as I won't be able to report on the Flight B final. If you didn't know it already, I hope this year's two GNT match reports have convinced you that contract bridge at a high level is a very difficult game. No player I've ever kibitzed has gone 56 or 64 boards without making errors, and that includes national and international stars I've watched at NABC's. I hope these reports are accurate snapshots of the state of the art in New England. If I report might-have-beens as well as the facts, it's only to make points we can all learn from. I can't promise to gloss over mistakes, but I don't write about them to denigrate anybody. I hope these players are still my friends, even when in my opinion they made questionable bids or pulled the wrong cards. Like all bridge players, I do the same myself and so I suppose, dear readers, do you.